Wisteria pruning can seem daunting but if you love the fragrant racemes of delicate flowers but really can't face all that precise snipping in July (new shoots to 6 leaves) and again in January (shoots to two or three buds) just find the right spot and let it run wild! This wisteria has a wonderfully wild exuberance about it which is lost when the plant is elegantly trained and restrained flat against a house, I love the sheer size and untamed extravagance of it. Untouched by secateurs for 16 years it is smothered in flower every year and fills the air with the most beautiful scent. (This picture does not do it justice.) Smothering a drab apple tree in my town garden the climber flowers late compared to other wisterias. I can't be sure of the cultivar as it was already in the garden, a thin, unpromising set of twigs pointing up an apple tree. It has never failed to produce a dramatic display despite my failure to prune or feed! The only slight management has been to unceremoniously lop off bits which grow low over the lawn when they begin to poke people in the eye. It has the apple tree in a tight embrace, or is it a strangle hold? For now the tree is surviving, blooms and fruits despite its burden. Wisteria is really rather a magnificent garden thug by nature so if you want a mound of trouble free bloom in late spring or early summer find the right place and set one free. I am a live and let live gardener, I trust that in the fullness of time most pest populations will be kept in check by other things that live in my plot. As an organic gardener I don't spray at the first sign of trouble, I encourage biodiversity, use companion planting, construct physical barriers and rely on growing strong plants that will shrug off a pest attack, normally this works, things do sort themselves out. The great exception to this is the gooseberry sawfly, last year they ravaged the fruit garden, I was hoping the harsh winter might have done for them but no, they have started their relentless campaign of defoliation again! After just a few days away I wandered into the fruit patch to find four of my gooseberries looking forlorn completely without leaves, tiny fruits hanging on to the naked branches. The culprits had already left the scene, stuffed with gooseberry leaves they are probably already in their silk cocoons pupating in the soil. The problem is I know the next generation are on their way. The gooseberry sawfly is the most impressive pest I have ever come across the small green- brown caterpillars with black markings hatch from eggs laid on the lower leaves of the plant they then very efficiently eat their way along the branches leaving nothing but leaf stalks in their wake (actually they don't touch the fruit either). In just a couple of days the plague of caterpillars can strip a bush, they then pupate in the soil. I have spend hours (no exaggeration), shredding my hands picking off the caterpillars but there are always more! When the first wave vanish the naive might breathe a sigh of relief but battle veterans know another generation will appear, in fact there are three generations a year from late April to September. Last year they first stripped the gooseberries, moved on to the red and white currants and finally for an encore ravaged the jostaberries. Sturdy bushes will recover but harvests the following year will be affected and repeated defoliation will weaken and kill the plant. Its time for retaliation, they may have won the first round by stealth, taking advantage of my absence but the fight is not over! Picking off the culprits just is not an option this time, it just didn't work. I have read about various DIY concoctions from steeped plant leaves used as a spray but they are all from toxic plants and sound a little too unknown for me. This year I have decided to get tough and employ the assassins of the pest world, nematodes, in the form of Nemasys Grow Your Own, which is completely harmless to the environment. I am ready for the next generation. Round 2 to the nematodes I hope! Free chive edging is looking great. The chives which line the long beds in the veg patch are looking marvelous. The purple pompom flowers are just beginning to burst from the equally beautiful, elegant buds. This is especially satisfying because they cost nothing, in fact they are the reward for some shamefully lax weeding practices. When I set out the fruit garden I used chives to edge the long beds. 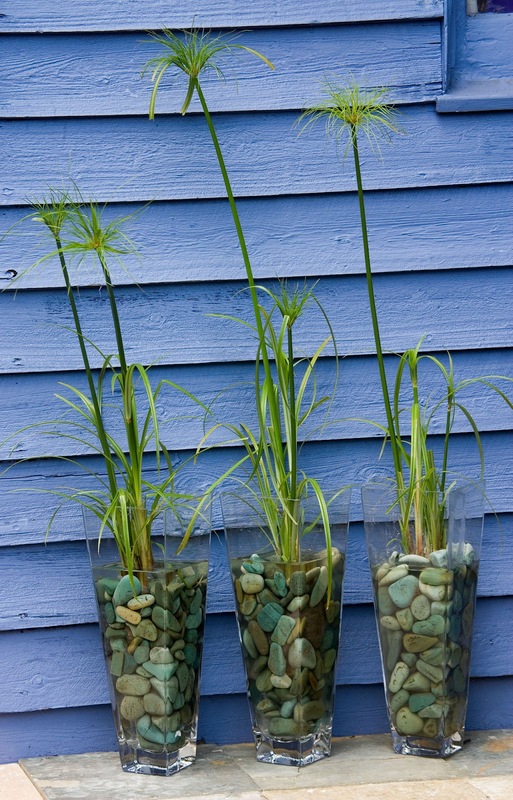 Chives make an easy, useful, informal edging and they look fabulous. When I set out the veg patch a year later with the same layout I needed more chives to mirror the scheme. Fortunately I found plenty of plants self -seeded around the garden, almost all I needed! A real bonus when loads of plants were needed to line the 7m long beds. If I had been dutifully hoeing the beds a quick, shallow shuffle of the hoe would have sliced the growing shoots before they broke the surface. A nice sharp hoe is probably the best tool in the battle against weeds, getting them young. When things do get out of hand, finding useful seedlings in a weed covered bed is at least a small compensation for a nasty, tedious weeding job. Verbena bonariensis, Stipa tenuissima, Verbascum, Digitalis and Papaver somniferum often pop up in unexpected places and I gratefully move them on. I weed around the desirable seedlings and leave them to grow on until they are a good size to move or pot up. My chive seedlings were bolstered with a few clumps cut from the existing plants in the older beds, (chopped out with a bread knife) and just a year or so later they are the stars of the veg plot this week. Exotic and brilliantly colourful this amazing bougainvillea with its intensely coloured bracts, sits forgotten in the corner of the conservatory all winter, then almost overnight it puts on this fantastic show which lasts for weeks and weeks. The plant was a free gift with the house so I don't know its age but it seems immensely happy with its lot. It lives in an unheated conservatory which gets pretty cold in the winter and amazingly hot in the summer. For part of the day at least it tolerates the full heat of the sun as the conservatory roof is only partially shaded. Bourgainvillea can withstand temperatures as low as freezing so long as they are kept on the dry side and I am sure mine has endured temperatures of around freezing, causing it to lose leaves, but it recovered. It gets scant watering in the winter and a good slosh once a week when the weather warms up. Too much water in early spring can be a cause of poor flowering in bougainvillea. When I say flowering I should point out that the flashy coloured bit is a bract, the flowers are far more staid, insignificant little trumpets held at the centre of each cluster of bracts. As for feeding, well it gets a couple of general purpose plant food slow release pellet shoved into the soil about now ish, that's it. Since it is a fairly big plant (though it does not object to pruning) and a lover of good light the bougainvillea is probably best suited to life in a conservatory, but if you have the right spot it is very easy to keep. The rampant splash of colour this wonderfully undemanding plant is delivering is all the more welcome because outside it is grey, miserable and still raining! Low maintenance containers- marginal plants in pots and catching up. A fabulous watering can, soon to be festooned with flowers and an olive jar awaiting the papyrus still sheltering inside! An update is undoubtedly a tad overdue, things have been happening and several projects have progressed despite the weather: In front of the house tarmac has been ripped up and a new streamlined driveway set out- more garden, less car park; in the veg plot a plethora of seeds and young plants are now in the ground; the 'hideous corner' is at least partially transformed into somewhere nice to eat and in the new cut flower area lasagna beds have been heaped up and seeds sown. All of this work has been hampered, delayed and in some cases damaged by the staggering amount of rain we have had. It has fallen with such force seedlings have been squashed into the ground and a gorge cut into the base prepared for the new drive (building work on the drains was stopped by the ceaseless down pour!). It is still raining, but this rain is nothing compared to the deluge of previous weeks, we have even had a few dry days, with sun! So it has all been a bit of a battle, not very photogenic and very, very, very muddy. Progress has been made in snatched moments when the rain eases or by spending hours bundled up in waterproofs and wellies. Updates for each project in the next few posts. Bank Holiday Monday was a much needed sunny day, so, as a treat, I started on one of my low effort container projects. I love plants in pots, though I have frequently vowed to kick the container growing habit, normally when I am hastily struggling around with the watering can in time I don't have. My problem is basically plants in pots look great. A striking plant in a great pot can transform a space, paving and decking can look bare and uninviting without a collection of artfully placed pots. In short they are the best and easiest way to decorate the garden and give an outdoor space a lift. Buying new garden pots is like buying new curtains, cushions and throws for a room, an easy way to add a touch of pizzazz to a tired scheme. Windswept marginal plants, at least it is not raining. So, as a lover of the decorated garden and change, it is no surprise I depend on interesting planted pots to keep the garden looking good. The problem is the watering. Irrigation systems are not an option for the most part and in some locations the black feeder tubes are just too unsightly. My solution is to minimize the drudgery of watering by concentrating on either plants which thrive growing in water, aquatics and marginal plants or those which need very little water indeed, eliminating the need for the daily round with the watering can. The walled area around the back door will get the maginals and the rejuvenated hideous corner and family terrace the drought tolerating sun lovers. The permanent pots, mostly home to acers, olive trees and topiary (three further weaknesses) only get a good water once a week anyway. Any container which will hold water (or can be sealed) is fine for marginal plants, I have chosen to use blue glazed pots and fittingly enough for a water garden of sorts, vintage galvanized watering cans. Often glazed pots will have an unglazed base, this can be sealed with PVA or by smearing it with a good coat of silicon sealant. I have also successfully stopped up drainage holes with a good squirt of silicon sealant in and around the hole topped with a piece of ceramic tile. The plants can be left in their baskets and gravel ( polystyrene, plastic pots or what ever is to hand) used to fill the containers so the plants sit at the right depth in the water (though don't get too hung up on this there is normally a good range of depths the plants will tolerate). Adding a few chunks of Charcoal keeps the water sweet. There are a vast array of aquatic and marginal plants to choose from, prolific flowers, lush foliage plants and dramatic architectural specimens, most will put on a great show year after year. I have one king Cup, Caltha palustris, which has sat in the same glazed water bowl for about 6 years, I recall only adding more water once or twice each year, ( yes, it has dried out occasionally) and every spring it erupts into a mass of shinning, fleshy yellow flowers. Perhaps the most interesting part is that the root ball is wrapped in a couple of layers of cling film with holes stabbed into it, a temporary, quick fix that has proved a long term success. 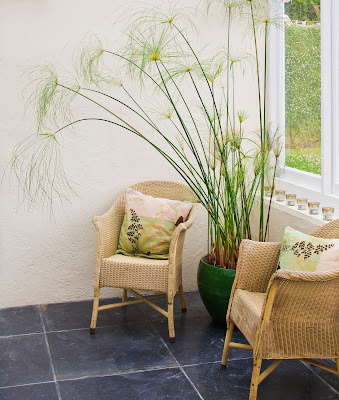 The area around the back door is partially enclosed by a tall stone wall which faces amost due south so it is a real hot spot, ideal for one of my favourite water lovers, real papyrus (cyperus papyrus). 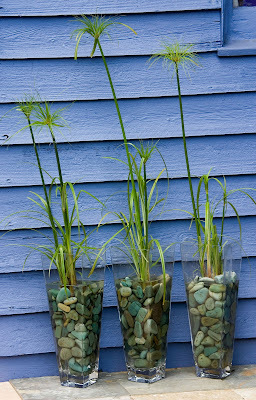 I say' real' because I have heard umbrella sedge, (cyperus involucratus) called papyrus, a nice enough plant but stumpy and inelegant when compared to the exotic looking real thing. 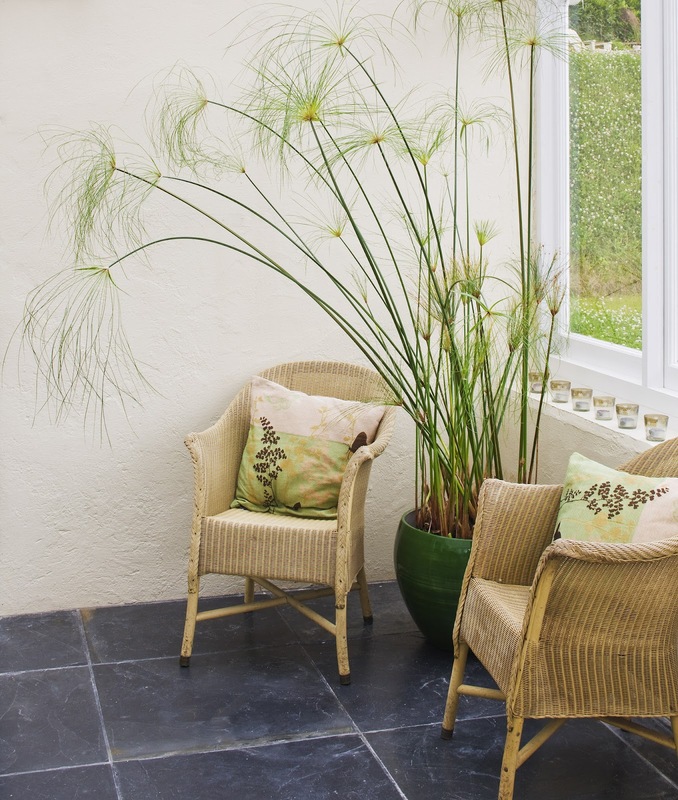 The papyrus should grow to about a meter and a half with each stem topped with a huge fountain of fine foliage, the perfect plant to soften the imposing wall. The only snag is papyrus is tender and needs to spend the winter inside, no hardship if you have the space, they look spectacular in bathrooms or conservatories. Mine survived this very chilly winter in an unheated conservatory. The olive jars against the sunny wall. Just waiting for the papyrus to grow! When the plants arrived I cut off the tatty stems, new ones are just about visible. The delicate, downy geum rivule, Water Avens, a native marginal and damp meadow plant, should flower from April to September and will soon fill its chunky, ribbed container at the centre of the table. The perfect location to appreciate its demur, drooping blooms. Other olive jars have been crammed with a combination of flowering and foliage plants which should soon flush out an put on a good show. Ranunculus lingua Grandiflorus, Great Spearwort, when really happy, will grow to 120cm but cooped up in a pot I will be happy with half that, it should be smothered with glowing yellow flowers throughout the summer. The grass, Phalaris arundinacea var.picta, Gardener's Garters, a real toughie, makes an attractive fountain of variegated leaves (see the pic at the top of the page), which should look striking in the olive jar once it reaches couple of feet tall. It will thrive in up to 25cm of water. Even my treasured battered vintage watering cans are playing host to aquatic plants. See pic at the top of the post) An old galvanized horse trough has been given a new life with a buttery yellow water lily ( and after family pressure oxygenating weed and a few fish!). A few more plants are needed to complete the scheme and it will take a while for the plants to reach their best, (progress pics to follow), but I imagine my watering time will be minimal, especially if it keeps on raining! I am harvesting as much water as I can to keep the pots topped up through the summer. Talking about drought tolerant plants as I watch rain violently splattering the window seems quite wrong, so next time. The dried stems and seed heads of last year’s perennials are finally getting the chop. Perhaps this may seem scandalously tardy to some, but I would rather leave the drifts of perennials to age, for the most part, gracefully through the winter than spend months looking at drab patches of bare soil waiting for spring bulbs to show. The Upper Deck in February. Miscanthus 'Yakushima Dwarf' and Monarda 'Scorpion'. I leave the skeletal stems as long as I possibly can, until their ragged untidiness gets to me, which is probably way longer than those of the neat school of gardening could tolerate. Through the autumn and winter the shriveled blooms and stems are given new charm as they shimmer when caught by golden winter sunshine and sparkle fleetingly when encrusted by frost. The swathes of straw like stems, fluffy seed heads and delicate framework of umbellifers look fantastically appropriate to the season - it is second glorious bite of the cherry. The plants that provided a colourful pageant through the summer go on to deliver a quite different, muted, but no less splendid display, through the colder months. Wildlife benefit too: the deft gymnastics of a goldfinch swinging on slender stems to get at seed heads is prize enough but insects benefit too I think. Some plants seed heads are more attractive than others and the ghosts of some perennials and grasses are more robust. When I plant now I now try to imagine my schemes not only in the summer but how it will look in the autumn and winter too. Plants will stay in best shape in sheltered gardens. In areas whipped by savage winds or really damp spots toughies like teasels and verbascums have the best of remaining upright. Achillea 'Walter Funke' in February after frosts and snow. There are practical advantages to leaving the cutting back until late winter. The first is you know where plants are. Pretty basic stuff, but if you are planting bulbs, adding new plants, weeding or applying mulch, it helps. Secondly, the old growth provides a protective tangle over new soft growth as spring approaches. Finally, you get masses of plants for nothing - no work required, no money changes hands. I love this bit, the plants set seed and these are distributed naturally through the beds and tiny plants spring up bolstering planting, replacing those perennials which have a short life. In this way the planting becomes dynamic and interesting, a self generating colony where some types of plant will thrive and others will dwindle. Those most suited to your patch will thrive. At some point you may decide to intervene to redress the balance by removing some seed heads or organise the chaos by moving plants, but allowing nature to take at least some control will reduce your workload and spend. This also saves the environmental costs of buying in plants raised in a nursery - all excellent reasons to leave seed heads alone and weed carefully preserving young seedlings. Thrift and time-saving, brilliant. How about the downside of cutting back late? Well, if you dally too long plants will start growing apace making cutting back more challenging as you try to snip around the new growth. Seeing the beauty might be a problem for some, choosing plants that have a sturdy framework helps, as does smartening -up a bed by taking out plants as they become too tatty for you to tolerate rather than waiting for one epic session of cutting back. The task of cutting back large tracts of planting can be back breaking and leave you with an aching hand, from which the secateurs have to be prised . The large Miscanthus like ‘Grosse Fontaine’ can be a real challenge to cut back in any number so now, after a tip from a landscaper, I fell them with a petrol hedge trimmer. There are probably lots of reasons why this is not the best method, but it works. Having enjoyed some of these plants for seven or eight months the process of cutting them back is just about finished. Once I have cleared the old growth, I weed and spread a layer of mulch. The beds look rather bare but spick and span and ready for spring.